What do well-funded schools look like? Below are a few things we could do to create well-funded, dynamic and engaging schools. What would you add, take away or modify? Create smaller class size; I don't care what the research says, I just know I can be more effective when I can know fewer students more deeply. Right now, I have 125-145 students, depending on the day. When I taught at an independent school, I had about 60-80 students/day. Build and maintain beautiful school facilities with a fully funded library, computer centers (or 1:1 laptops as needed), resplendent arts studios and athletic programs, well-funded class trips, and access to green space. These sorts of things already happens in some schools, but it sometimes means we create privilege rather than cultivate democracy. Have healthy, sustainable and tasty lunch programs - free to all, including faculty and staff. Foster flexible teacher leadership so that individuals can have one foot firmly in the classroom (with benefits) and another foot in research-world (for policy, curriculum studies, or professional development). Each school would formally have at least 1 such teacher leadership position for every 10 teachers, and the capacity for other positions to be created. 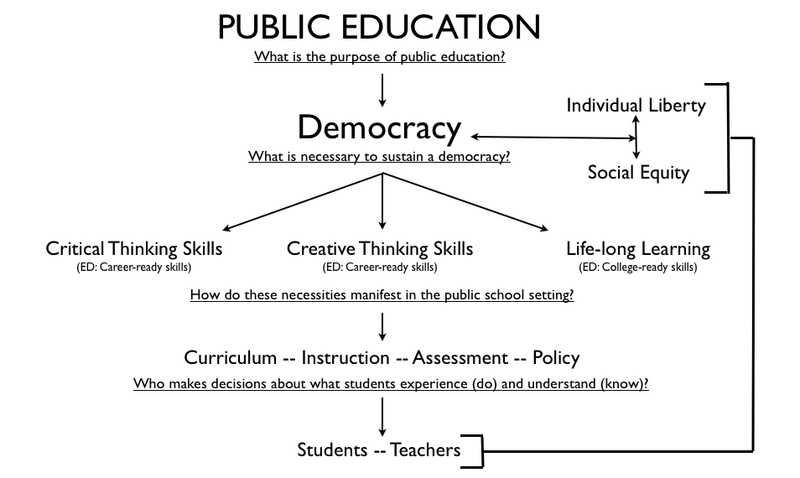 The more-than-adequate financial support of public education is an expression of democracy. Unfortunately, public education is under-funded. Teachers need to balance defense of the profession (How can we manage budget cuts?) with advocacy for students (How can we ensure smaller class size, for starters?*). 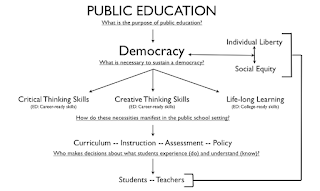 What can we do to help advance the idea of public education as a foundation for our democracy (assuming we agree)? * What are some features of adequately-funded democratic education? See subsequent post. Once they take away job security and collective bargaining rights, what’s to stop them from taking away pay, benefits, and everything else?" There's also an interesting discussion about how school choice has been used to undermine public education. I agree. Though I'm unsure about the demonization of "choice." I think choice has been redefined, inappropriately, by some sectors within our society, as a method to privatise public education. But what if we reclaimed choice as an expression of democracy? For example, why not advocate for teacher-led public schools that offer a variety of choices in terms of curricula, instructional strategies, community partnership, etc.? One-size curriculum for all, where all students have to be tested on the same day, doesn't give teachers or students much choice about how or what or where they learn. At the school level, effective teachers can provide choices for individuals within any particular curriculum. Yes, we will study "cells as building blocks," but what are the myriad of ways that well-supported teachers can help engaged students choose how they develop, or experience, that scientific understanding? And we've got to give teachers choice in the schools they serve. In the larger districts, such as Philadelphia's, teachers are assigned without any consideration of "best match" to a specific community. Students, parents and teachers should be able to interview prospective teacher candidates and then choose those that are best aligned with that community's pedagogical approach -- all in the name of democracy. We've got to develop the capacity of our schools to make smart choices that maximize individual freedom while also honoring collective equality (if not equity). And if we can't trust our teacher leaders to do this, then we have a serious problem.